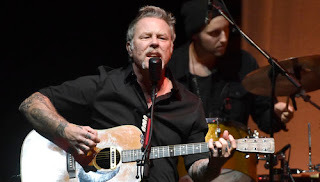 Metallica supported its All Within My Hands charity foundation with a 12-song acoustic set this past weekend in San Francisco. The band's set included rearranged versions of its own songs, along with acoustic renditions of some tunes from classic rock heroes like Bob Seger, Deep Purple and Blue Oyster Cult. Band members James Hetfield, Kirk Hammett, Robert Trujillo and Lars Ulrich were joined by a quartet of backing musicians who provided additional percussion, keyboards, strings and vocal harmony. While Metallica has several downtempo tunes that prominently feature acoustic guitar, the set fully embraced the band's thrash roots. "Disposable Heroes" from 1986's Master of Puppets was the opener. The All Within My Hands foundation is aimed at improving workforce education, providing critical local services and especially fighting hunger. Ulrich revealed during the band's WorldWired tour that for years Metallica has been donating time, money and food to charities in every city they play. Leading up to the band's second annual Day of Giving this spring, Ulrich wrote in a Rolling Stone op-ed that the band started the foundation and began publicizing its efforts in hopes of increasing volunteer-ism worldwide.